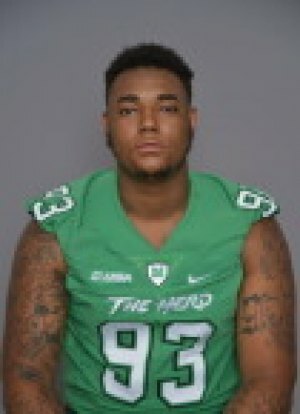 A man shot at a New Year's Eve house party in Severn, Maryland, has , according to the Herald Dispatch, been identified as Marshall University football player, Larry Aaron. The Baltimore Sun and WJZ-TV both reported that an adult male had been hospitalized with non-life threatening injuries after he was shot in the back. He was shielding his girl friend when he took a bullet which is lodged in his spine. Aaron's father told WBAL-TV that ""he was standing up against the wall with his girlfriend and two guys got into an argument, and they just started shooting and my son stepped in front of his girlfriend to shield her, and one of the bullets got him." He was taken to the University of Maryland Shock Trauma Center, according to the Sun. A 17-year-old was also shot at the large party. Police there are searching for suspects. The Herald Dispatch quoted Aaron's mother, Melissa, as confirming that the victim was Larry, a red shirt freshman on the Thundering Herd. He played in eight games in 2017. His mom stated that at the time of the interview with the HD her son had "no feeling in his spine." An altercation apparently broke out at the party , but Aaron was standing by a wall when the shots were fired. His mom has praised the Marshall community for their assistance. Teammates are at his side, the HD reported. "It is however with a heavy heart that we bring in this new year as I send my thoughts and prayers to Larry Aaron and his entire family during this difficult time. Your @HerdFB family is here for you. #HerdStrong"
Maryland officials are searching for the suspect and are trying to find out a motive for the incident. Anyone with information is asked to call the Western District Detective Unit at 410-222-6155.